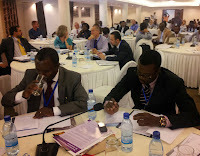 TJN has just held a seminar on transfer pricing in Dar es Salaam, Tanzania. The seminar programme is available here. Click on the links in the headlines below to see the presentations themselves. See also our transfer pricing page. This event followed on from an international conference we organised in conjunction with our partners at the Government of Finland and the development NGO Kepa in Helsinki last year. More information about last year's event is available here. The seminar attracted government officials, officials from inter-governmental agencies, practitioners, researchers, activists and others from many countries. The following summary notes from the seminar have been prepared by the rapporteur, Adrienne Margolis. In 1996 a Canadian company said that the Tanzanian government would receive US $100 million in taxes annually in return for starting up a goldmine. Artisan miners were violently dispersed. Over the 12 years since then the companies paid one 10th of what it promised. This is unfair to host communities whose lives and livelihoods have been destroyed. “Companies in the extractive industries are not very good corporate citizens. But this is a sideshow. The real show is the laws that have allowed them to get away with murder.” Tundu Lissu, M.P. Transfer pricing in South Africa is wide in scope. It precludes downward adjustments. There are no specific transfer pricing rules for extractive companies. Taxpayers are using offshore marketing companies in tax havens and low tax jurisdictions. One of our investigations showed that in 10 years, 10 billion rand worth of profits were channeled through this arrangement. With the advent of democracy in South Africa in 1994 the country faced a number of constraints on development. It has weak and economic growth which has revealed a tax system not fit for purpose. Transfer pricing and illicit financial flows are contributing to rising income inequality. Improving transparency and mandatory reporting of payments are priorities. Policy and legislative certainty are needed. The transfer pricing law was enacted in 1996. In 2012 a law was introduced with different fixed margins the different economic sectors. There were also simplified rules for commodities. This removes the distortion of competition in the country as companies are subject to the same tax burden. It is easy to implement and low cost. As long ago as 2000 a parliamentary investigation found pharmaceutical companies were overpricing inputs by up to 5,000%. The problem is not new. Tax havens are the real problem. Since 2010 Brazil has drawn up a list of 65 jurisdictions with no or low taxes and /or no transparency. Taxpayers are now required to declare transactions with related parties or residents in tax havens. A report was published this year by the OECD on base erosion and profit shifting. This was followed in July by the publication of the BEPS Action Plan which was welcomed by G20 leaders. If governments are not happy with the current international tax rules the plan will provide recommendations to change the rules. The actions set out in the plan will be finalised by December 2015. Input is being gathered from a range of stakeholders including developing countries. The OECD also has a tax and development programme that includes the Tax Inspectors Without Borders (TIWB) initiative. Tax experts from a country will be directly deployed to work with local tax officials of a developing country on current audits and audit related issues concerning international tax matters and to share general audit practices. In some cases this will require funding from donors to meet the costs of the deployment. This is not the first time this issue has been addressed. In 1998 the OECD published a report on harmful tax competition. It has taken 20 years to get to where they are now. This new project is ambitious and requires a long time scale. Civil society groups need to contact the OECD if they want to be involved. The OECD approach is limited - we need to move towards unitary tax. Success stories like Norway, Chile, and Botswana have things in common. They include transparency, creating a stable revenue base, investing in education, social programs, infrastructure and setting aside reserves the future. Transparency and accountability can be best achieved through country by country reporting leading to a unitary taxation approach. There are 10 reasons why this is a good roadmap. Should Kenya adopt it, and if so, how? Revenue authorities, accountants, corporations and tax experts interviewed concluded Kenya is capable of using country by country reporting and it would simplify the system. International adoption would help because global problems need global solutions. Africa is number one in the world for many metals and minerals. The continent is rich and citizens have a right to know how governments are selling their resources. Conflicts start because people feel bypassed. Multinational companies and governments benefit so they do not want transparency. The African Mining Vision is very important – so is the high-level panel on illegal financial flows chaired by Tabo Mbeki. Tanzania is the most mineral rich country in Africa. Around 50% of exports are from the extractives sector, but in 2012 it accounted for only 4% of government revenue. It is location specific and returns vary between locations. Aggregation delays tax revenue to the government. The tax regime was based on contracts dating back to the 1960s. It meant that the country was losing lots of revenue. The mining code was also old. Recently, in the case of one gold mining company, people felt the contract was unfair. They demanded that the government renegotiate the contract. Also, there was no minimum tax legislation. The company was told to renegotiate or leave. The company renegotiated – it wanted legal certainty. Now there is an assured minimum tax in place for the life of the mine even if they engage in transfer pricing. Developing countries are ripped off by extractive companies’ hedging. Thin capitalisation allows companies to use loans to finance setting up other mines. This has led to huge revenue losses to Tanzania. The 2012 Finance Act has strengthened the rules to reduce abuse through tax deductibles. There are lots of abuses in the telecoms sector because it is fast-growing. But it is generating very little tax revenue and shell companies are used when telecoms companies are sold on. The law needs to be strengthened to ensure export levies are paid. It is crystal clear that multinational companies will always seek higher profitability and reduce their tax liability legally or illegally. We don't know how much money we are being deprived of. We face common challenges. In Rwanda the Constitution comes first. This is not the situation in most countries. The country used a Dfid (UK Dept of International Development) funded process to put its international tax regime in place. This means they never interrogated their legislation. The amendments are now being put in place. In revenue authorities lawyers are not often trained in transfer pricing. When Rwanda tried to change transfer pricing rules it got stuck. Changes were needed before the rules could be enacted. Almost everyone thinks unitary tax is the best way forward. In July 2011 transfer pricing regulations came into effect. With support from the global transparency movement we are putting frameworks in place for extractives. We need to analyse the complexity of the industry that we're being asked to tax. We need effective dispute resolution and new ways to allocate profits to low tax jurisdictions. Unitary tax better reflects the modern corporation. It reflects the whole, rather than the legal parts. You first need to harmonise the tax base. You also need to consolidate cross border. · One of the great achievements of the OECD report was to highlight that dealing with transfer pricing is not enough. · What would the greatest political barrier be taking steps? Any attempt to plug loopholes to prevent tax avoidance is met with cries from transnational companies that it will lead to job cuts. Ghana's attempt at introducing a windfall profit tax in mining has met with this response. In 2000 a new tax law dealt with tax avoidance schemes. In 2012 new transfer pricing regulation was introduced. · Lack of proper transfer pricing legislation or lack of any legislation is a problem. There is an adequate human capacity to deal with it. Taxpayers are unaware of the full scope of transfer pricing arrangements. · It is not clear that the arm's-length principle is understood. Feedback from members and partners is that we need to develop legislation, capability and engagement with taxpayers. Update: for more information on corporate tax, see here.